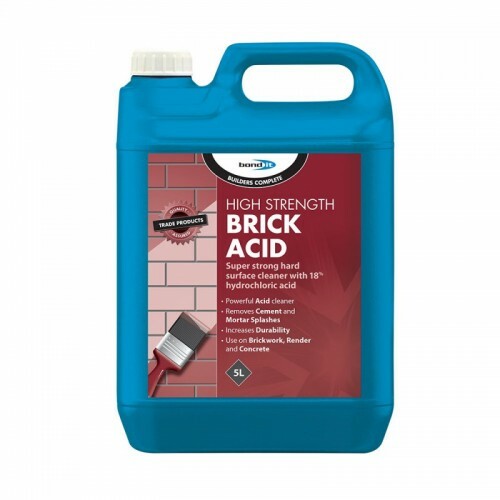 A super strength (16% hydrochloric acid) cleaner that will remove cement and mortar splashes from brickwork, paving, concrete floors and warehouses. For removing cement and mortar splashes, light oil stains and grease from brickwork, paving, tiles, earthenware and concrete. This cleaner should not interfere with the various types of concrete and stone (except limestone and marble) commonly encountered in the general building area. Efflorescence can also be removed by using this product diluted. Test a small area prior to application. Product should be diluted to recommended levels. Apply by brush and allow to stand for 10-15 minutes. Do not allow to dry out. Scrub with a stiff brush then rinse thoroughly with a hose pipe. Can be used undiluted for stubborn stains. Note: this product will attack limestone, marble, stainless steel and aluminium.